Trying to decide between InMotion vs Bluehost for your web hosting service? This Bluehost vs InMotion Hosting review will provide a detailed overview of both services, and compare what they have to offer. We will look at the packages each host offers, as well as their pricing and the performance rating. Security, usability, customer service, and other unique features they offer will also affect how each company rates in this InMotion vs Bluehost comparison. One of the most important aspects of a web hosting service is how they perform. Uptime and page load speeds are a big part of that, and they are easy measurable. Bluehost has an average uptime of 99.93% which is just below average. InMotion Hosting’s average uptime is 99.96%, slightly above average. While InMotion Hosting is more reliable, Bluehost is faster with average page load speeds of 1.4 seconds. InMotion Hosting’s page load times average is of 3.32 seconds. Bluehost and InMotion Hosting are tied in performance. Bluehost offers a wide range of plans, from cheap, shared hosting to dedicated servers. Their shared hosting is usually on sale for around 80% of its usual price. InMotion Hosting offers their plans on sale for a similar price. After the promotional period, the cost goes higher than Bluehost pricing. InMotion Hosting also offers VPS, reseller, and dedicated hosting to their customers, just like Bluehost. Bluehost and InMotion Hosting are also tied in this category, due to the major similarities in prices and plans that they offer. In terms of security, Bluehost offers CloudFlare CDN with their plans, which helps to prevent a DDoS attack. They also provide spam filtering and hotlink protection. InMotion Hosting goes above and beyond by providing safe application roll back, so if something goes wrong you can go back to a previous version. They also provide their web hosting customers with an advanced server-side firewall and 24/7 server security monitoring. InMotion Hosting comes out ahead of Bluehost in the InMotion vs Bluehost security comparison. Bluehost and InMotion Hosting are well matched in the arena of user-friendly features. Both hosting services use the cPanel as their control panel of choice. They also offer a drag-and-drop website builder with free themes to use. The biggest difference between these two power-houses is that InMotion Hosting provides free, no downtime website migrations for up to 3 cPanel accounts for new clients. InMotion also provides a 3-click Google Apps integration. InMotion Hosting has 24/7/365 US-based customer support that is available via phone, email, live chat, or a ticket system. They also have a 90-day money back guarantee. Bluehost also has 24/7/365 customer support that can be contacted by chat or phone. Their money back guarantee is only 30 days. While both companies are similar in what they offer for customer service, the biggest difference here is the customer reviews. Customers complain about Bluehost’s slow response time. Reviews on InMotion Hosting’s customer service are much more positive. Here is the best and the worst of Bluehost all summed up. Over 300 one-click install applications. Large price jump once the introductory period is over. Now here is a list of the pros and cons of InMotion Hosting’s services. Great security for the cost. Free website migration with no downtime. Slow page loads for SSD. Large price increase after promotional period. 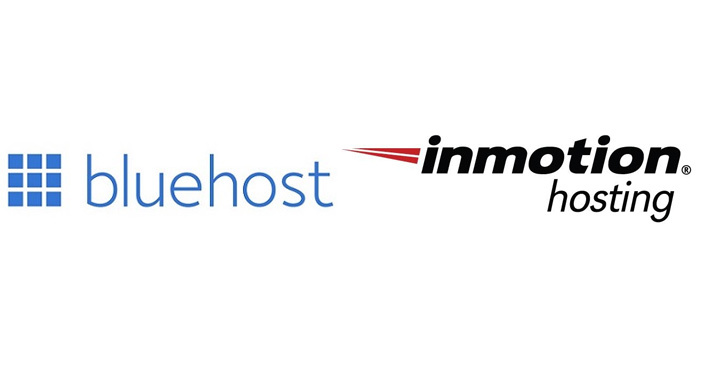 Overall, InMotion Hosting wins the InMotion vs Bluehost contest. Bluehost is not reliable enough in their uptime or their customer service. InMotion Hosting offers more security options up front, even for their lowest plans. While both companies have similar prices for their hosting options, InMotion Hosting gives the better bang for your buck. Have you used either of these hosts? We’d really appreciate your comments, questions or input. Please feel free to share with us below!